There’s only one Thom Yorke. Except, of course, when there are six of him. Or 20. Or an infinite number of disembodied, floating and singing iterations of the Radiohead frontman swirling around you. The Dutch artist, composer and programmer Tarik Barri makes copies of the singer at will inside the Hexadome, an immersive 360-degree audiovisual structure that completely surrounds an audience with the sights and sounds he created in collaboration with Yorke. “Basically, I’ve got Thom’s head floating around inside my virtual universe,” explains Barri. “I have audiovisual samples of him singing something. And I place that object inside my three-dimensional world.” Barri’s installation was one of nine original Hexadome compositions shown and performed at Berlin’s Martin Gropius Bau museum in the spring of 2018. As its name suggests, the Hexadome is comprised of six very large screens affixed to a metal skeleton reminiscent of a gigantic birdcage. The structure delivers auditory input to audience members inside it via a 52-channel sound system designed by the ZKM Institute for Music and Acoustics. The innovative concept was conceived by the Institute for Sound and Music (ISM), a non-profit initiative based in the German capital dedicated to sound, immersive art and electronic music, in conjunction with the visual arts studio Pfadfinderei. “This is a long time coming. The technology has reached this pivotal moment,” says ISM director Nick Meehan. Besides Barri and Yorke, the ISM organisers invited Brian Eno, Holly Herndon, Mat Dryhurst, Peter van Hoesen, Heleen Blanken and several other artists to create works for the unique AV platform. Eno, the famed producer and ambient music pioneer, de-scribes his piece as a generative composition, meaning it is constantly evolving and changing on its own. Herndon, by contrast, staged a performance with live actors demanding the audience in-side the Hexadome provide audio samples for an abstract installation crafted by an artificial neural network. All the artists using the Hexadome are invited to do a several-week residency at the ZKM in the southwestern German city of Karlsruhe to acquaint themselves with how it transports spatialized sound. But Eno opted to compose his work – several times anew – once he got inside the museum in Berlin. “It was a stunning experience – to see his creative process unfold and take part in what was essentially a private concert with Brian Eno in that gorgeous space,” says Meehan. The end result is Eno’s work “Empty Formalism,” which consists of slowly altering shapes and colors accompanied by ambient soundscapes that wash over the audience inside the structure. “I’m trying to make a psycho-logical state of some kind. 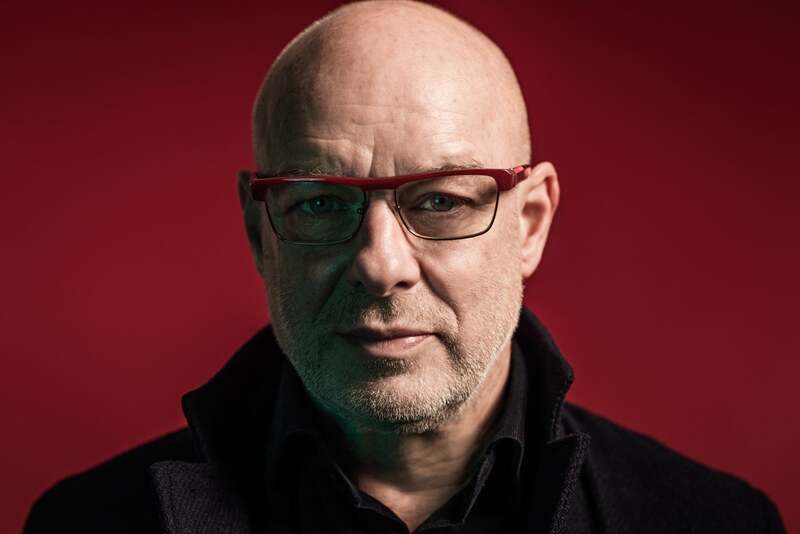 I’m trying to make a place in people’s minds where they can go and enjoy being for a while,” Eno explained at a press conference ahead of show. Stepping inside the Hexadome is a wholly different experience than strapping a set of virtual reality goggles onto your head. And that’s exactly the point: This is meant to be a communal event with others, not something immersive yet isolating. “I was blown away by how much difference it makes to use these 50-something speakers in this dome construction,” says Barri. 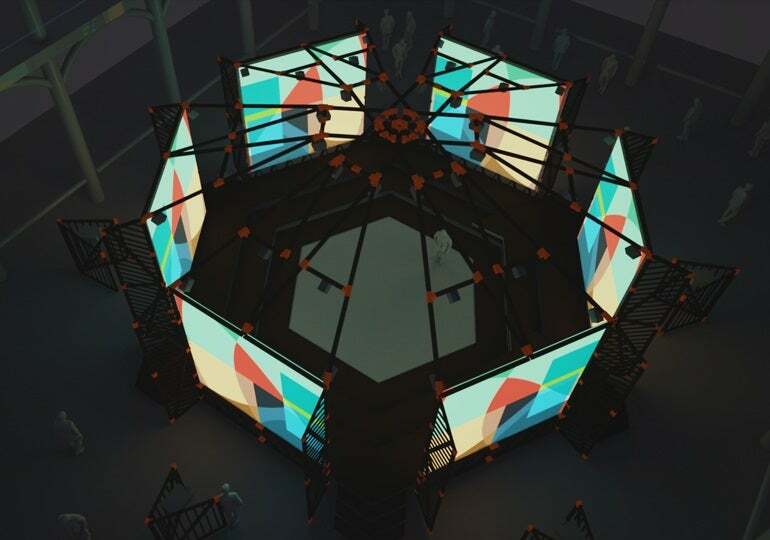 The ISM is now planning to take over more brains by bringing the Hexadome to North America in 2019 with a grant from Germany’s cultural organisation, the Goethe Institute. Along with the works shown in Berlin, there will be completely new performances and installations by other artists, says Meehan. The ISM Hexadome comprises six large rear-projection screens for advanced laser projectors, arranged in a hexagonal structure. Standing nearly eight meters high and spanning 15.5 meters wide, this metal skeleton also hosts a 52-channel Klangdom sound system developed by the ZKM Center for Art and Media. Arranged in a dome configuration, the speakers provide a fully spatialized sound experience. Klangdom is controlled by the ZKM’s software Zirkonium, which artists learn to operate during a three-week residency at the Institute for Music and Acoustics in the southwestern German city of Karlsruhe. The Hexadome can be used for both audio-visual installations and live performances. The Institute for Sound and Music plans to make the structure part of its permanent collection in a museum in Berlin dedicated to sound, immersive arts and electronic music culture.